This was something we spent an agonizingly long time working in the 2008-10 timeframe. We drafted a white paper on the subject…There were some very good thoughts on how to synergize the inter-agency, but the actual appetite to place bodies against the requirement just really was not there. What is interesting is the Ms Applebaum mentions the lack of strategy on Syria… there is a lack of strategy on EVERYTHING… why would Syria be a surprise? One thing we recommended to was the diagram above. There is little that can be done until the major strategy documents are synergized–as shocking as it may be–these are not synergized. So when there is a change to the NSS (assuming there is one) it will take a long time until the other documents come into review IOT be adjusted, but if they were re-aligned–we might have a national strategy. 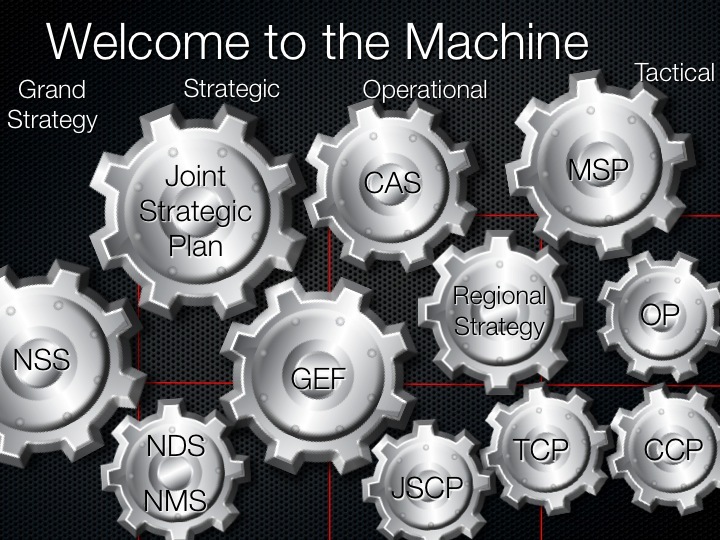 Obviously this is just a simple first step in real strategy making….but we could not even get there….although this slide did get many views among the interagency…there were never any real steps taken to make it a reality. Year in, year out, I am always unprepared for that first blast of Washington summer air, the one that hits like a physical force the moment between leaving the airplane and entering the transport bus at Dulles Airport in mid-July. Those few, non-air-conditioned seconds always serve to remind me that I don’t need the sweater that seemed so necessary in northern Europe, that I’ve entered a new time zone, that it’s time to re-adapt to the customs and habits of my home town. This year, I was equally unprepared for a new Washington phenomenon: the flat, stifling strategy vacuum that hits like a physical force when you enter a discussion about Syria. It’s not that nothing is happening here: On the contrary, various branches of the military-foreign policy and development complex are happy to say what they’re doing. The State Department’s Bureau of Conflict and Stabilization Operations has a program to aid local councils , media and civic groups in the liberated regions of Syria. The U.S. Agency for International Development is providing emergency assistance to Syrian refugees , about 1.6 million people. Just as I arrived in Washington, the nation’s most senior general published a memo on Syria , detailing several possible courses of action. Yet all of it feels uncoordinated, reactive and far, far behind the curve. Can it be possible that Congress is only now considering the use of “nonlethal forces to train and advise the opposition,” an option that Gen. Martin Dempsey, chairman of the Joint Chiefs, says carries risks that include “inadvertent association with war crimes due to vetting difficulties”? Could it be true that U.S. aid programs haven’t yet been coordinated with European governments, other than in some cases the British? As for the refugees, it’s nice that President Obama promised more emergency money last month, but those 1.6 million people will probably become 3.5 million by the end of this year. Emergency humanitarian aid doesn’t seem at all like the right long-term answer to this problem. Everywhere, the bureaucratic machine grinds at a glacial pace. Since last winter I’ve been hearing about a ­German-Qatari effort to create a trust fund for Syria, a mechanism used in stateless societies to coordinate humanitarian aid, build the capacity of local organizations and develop confidence in Western commitment all at the same time. But at a discussion of that very idea this week, I learned that the United States “might” take part in such an initiative — though, after many months, it still isn’t clear with whom we would work on the ground. At the same discussion, I heard that diesel generators delivered to Syrian villages don’t work because the Turks won’t export diesel fuel; that solar generators can’t be delivered because of U.S. export regulations; and that 100,000 people have now died, so shouldn’t we be doing more anyway. In every instance, the timing is wrong. The moment to throw support behind “peaceful activists” was right at the beginning, before most of them were killed or imprisoned. The moment to train fighters was soon after that, before the fighters were radicalized by years of violence and the assistance they’ve ­received from Islamic extremists. I don’t know if there was a moment for military intervention, but it’s clear that, after two years of brutal, polarizing conflict, there are no good options for the Pentagon — if there ever were. More to the point, I don’t hear anyone talking about the ultimate goal of any intervention, military or peaceful. Is the idea to defeat Bashar al-Assad and win the war? Or is the idea to end the conflict, enforce a cease-fire and create an inclusive government? The future goal determines actions — military, economic, diplomatic — in the present. If you have no goal, on the other hand, then your actions will be random, uncoordinated and inconclusive. They won’t inspire others. One hears that the French have delivered a suitcase of money to a local council, or that the British prime minister wants to arm the opposition, or that the Japanese are concerned about the absence of international coordination in Syria, which they fear sets a bad precedent for their part of the world. The European Union is divided on Syria, and the United Nations is headed by its weakest leader in living memory. With the United States on the sidelines, no one else seems able to create a “coalition of the willing” to engage, lethally or non-lethally, in helping to end the Syrian conflict. It’s odd: After the end of the Cold War, some thought we’d live in a unipolar world. Others thought we’d live in a multipolar world. Instead, we now live in a nonpolar world — and it’s every bit as stifling as a bad week in a Washington summer.